I never saw this pretty bird in any of our eastern districts, and rarely farther up the Ohio than Louisville, in the neighbourhood of which place it rears its young. Louisiana seems in fact better suited to its habits than any other state, on account of its numerous lakes, creeks and lagoons, over-shadowed by large trees, which are favourite places of resort for this species. It is fond of flying over the waters of these creeks and lagoons, and is seldom seen in the interior of the woods. Its flight is rapid, and more steady than is usual in birds of its genus; and as it moves along, the brightness of its colours attracts the eye. On alighting, it moves rapidly along the twigs, partly sidewise, frequently turning about and extending its neck to look under the leaves, from which it picks various kinds of insects. It often perches upon the rank grasses and water plants, in quest of minute molluscous animals which creep upon them, and which, together with small land snails, I have found in its stomach. 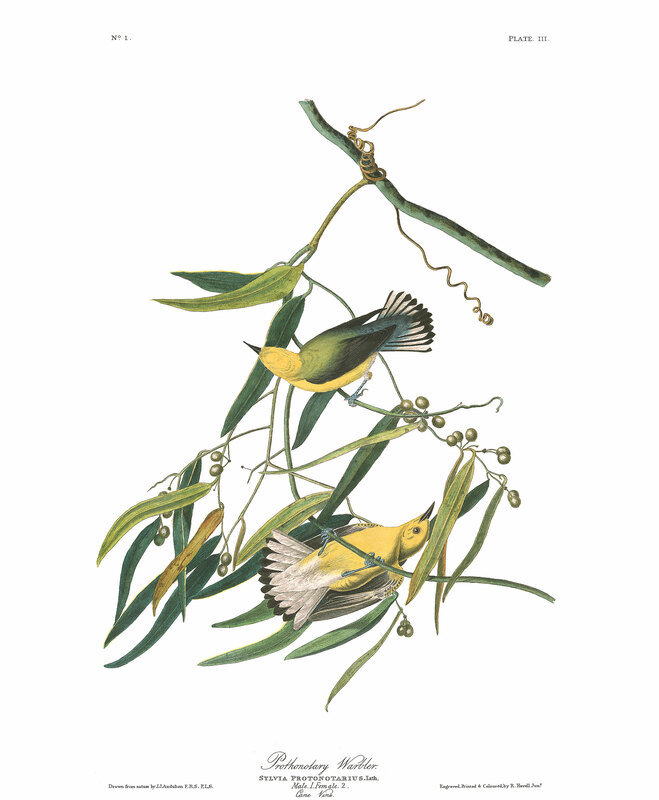 It does not, perform sorties, or sally forth after flying insects, as many other Warblers are in the habit of doing. It has a few notes for its song, which possess no interest. The males, when chasing each other, keep up a creaking noise, until the little battle is over, when they perch and balance their body with much grace and liveliness. I have observed their arrival in Louisiana to take place, according to the state of the weather, from the middle of March to the first of April. At Henderson, in Kentucky, they do not arrive until a month later. They remain until October, but, I am inclined to believe, rear only a single brood in a season. The nest is fixed in the fork of a small twig bending over the water, and is constructed of slender grasses, soft mosses, and fine fibrous roots. The number of eggs is from four to six. I could never ascertain whether the male assists in incubation, as the difference of plumage in the sexes is not perceptible when the bird is at large, and indeed can hardly be traced when one has procured the male and the female for comparison. It cannot be called a plentiful species. To search for them on the high lands, or at any considerable distance from the kind of places above mentioned, would prove quite useless. Dr. BACHMAN informs me that he has watched this species for hours at a time, when on the borders of streams, and observed it to seize insects on wing by gliding through the air after them, but never heard it click its bill, as is usual with Flycatchers. It breeds in South Carolina, and he saw a pair with four young ones near Charleston, on the 1st of June, 1836. The plant on which you see these birds, grows in swampy places, but is extremely rare, and I have not been able to procure any scientific appellation for it. In Louisiana, it is called the cane vine. It bears a small white flower in clusters. The berries are bitter and nauseous. The stem, which runs up and over trees, resembles that of other climbing plants, is extremely elastic, and as tough as a cord. The leaves, of which you see the form and colour, are also tough and thick. PROTHONOTARY WARBLER, Sylvia Protonotarius, Wils. Amer. Orn., vol. iii.p. 72. SYLVIA PROTONOTARIUS, Bonap. Syn., p. 86. PROTHONOTARY WARBLER, Sylvia Protonotarius, vol. i. p. 410. PROTHONOTARY WARBLER, Sylvia Protonotarius, Aud. Orn. Biog., vol. i. p. 22;vol. v. p. 460. Bill nearly as long as the head, slender, tapering, nearly straight, as deep as broad at the base. Nostrils basal, lateral, elliptical, half closed by a membrane. Head rather small. Neck short. Body rather slender. Feet of ordinary length, slender; tarsus longer than the middle toe, covered anteriorly with a few scutella, the uppermost long: toes scutellate above, the inner free, the hind toe of moderate size; claws slender, compressed, acute, arched. Plumage soft, blended, tufty. Wings of ordinary length, acute, the first and second quills longest. Tail nearly even, of twelve straight, rather narrow feathers. Bill brownish-black. Iris hazel. Feet and claws greyish-blue. Head all round, neck and under parts generally, of a bright rich pure yellow, paler on the abdomen, and passing into white on the under tail-coverts. Fore part of the back and lesser wing-coverts yellowish-green. Lower back and wings light greyish-blue. Inner webs of the quills blackish. Inner webs of the tail-feathers bluish-grey at the base, then white to near the tip, which is black, as well as the outer webs. The two middle feathers blackish, tinged with greyish-blue. Length 5 1/2 inches, extent of wings 8 1/2; beak along the ridge along the gap 3/4; tarsus 11/12. The differences which the female exhibits are so slight as scarcely to be describable, the tints being merely a little duller.